Anderson Cooper opened Thursday's AC360 with, Breaking news, everyone. Tonight, with signs of Gadhafi's inner circle is shrinking, perhaps even splitting, late word that Colonel Gadhafi might -- and I say might -- be looking for a way out. Britain's "Guardian" newspaper reporting tonight that the regime has sent one of Saif Gadhafi's most trusted aides to London for confidential talks with British officials, the paper's sourcing, British government officials familiar with the meeting, a British Foreign Office spokesman telling "The Guardian" the envoy was told that, bottom line, Gadhafi has to go and he will be held account an by international courts. Meantime, on the battlefield, in Libya, opposition fighters today fired rockets outside Brega. However, for the most part, they are still largely regrouping and waiting for the weather to clear, which would allow greater allied air support. For now, it's a strategy of shoot and run. GADHAFI EXIT STRATEGY?, Guardian: Envoy told Gadhafi will still face accountability: Anderson explained that CNN was able to send correspondent Frederik Pleitgen into Misrata. He got remarkable access to the opposition forces still fighting in that city. Here's what he saw. The British newspaper "Guardian" reporting a Gadhafi envoy traveled to London reportedly making peace overtures. There's also new word tonight of a fresh crack in Gadhafi's inner circle, another apparent defection, a former foreign minister now in Cairo denouncing the regime. The most recent foreign minister, Moussa Koussa, this man, meantime, is in Britain. Officials say he's talking to them willingly and that no deal was made to secure his cooperation. They say he's as close to Gadhafi as someone can be without being family. Yet, to hear the regime tell it today, his departure was no big deal and neither is he. "Keeping Them Honest," even if that scenario were not absurd on the face of it, it also runs hard into a freight-load of facts. Anderson Cooper spoke with Eliot Spitzer In The Arena about his exclusive interview with the four N.Y. Times journalists that were held captive in Libya. Anderson Cooper opened AC360 with a rundown on the breaking news across the Middle East and North Africa. RADIATION RISING IN NUKE PLANT SEAWATER, Authorities: Levels now 4,385 times limit: Anderson Cooper reports on the latest news of the nuclear power plant issues in Japan. On the day of the wedding, Friday, April 29, beginning at 4 a.m. ET, CNN’s special live program will be anchored by Piers Morgan, Richard Quest, Anderson Cooper, Kiran Chetry and special contributor Cat Deeley, noted British broadcaster and fashion expert, across CNN/U.S. and CNN International. 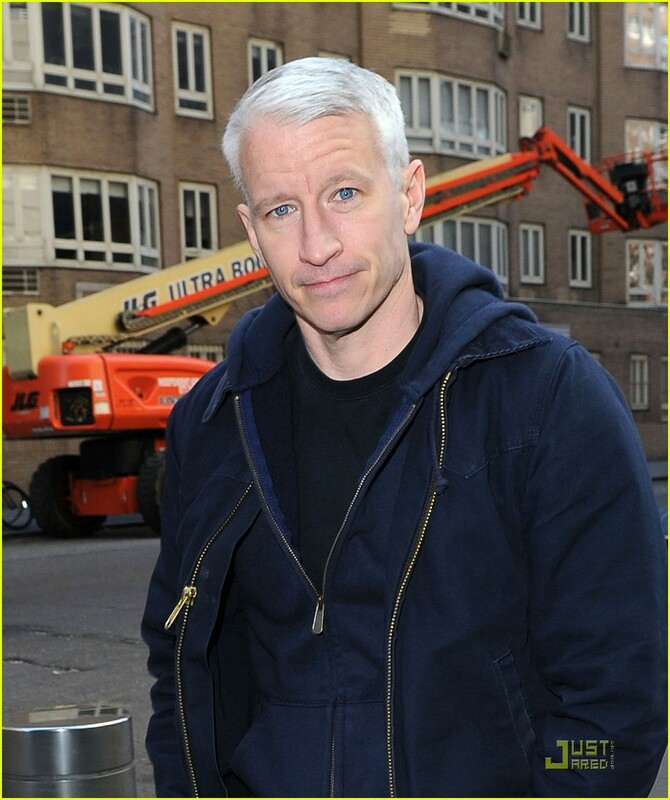 Wednesday, April 27 – Friday, April 29: Anderson Cooper will anchor Anderson Cooper 360, also live from London, at 10 p.m. ET on CNN/U.S. and CNN International. For complete coverage information please see our sister site, ATC. Just Jared posted two pictures of Anderson walking the streets of NYC on Monday morning. In March, CNN’s Anderson Cooper 360 was the #1 cable news program at 10 pm in the key demo adults 25-54, overtaking FNC’s On the Record with Greta Van Susteren for the first time in 26 months (January, 2009). For the month, AC 360 averaged 496k among adults 25-54, while FNC slipped into second place with 480k and MSNBC’s The Ed Show was a distant third with 266k. Compared to a year ago, the CNN 10 pm program had significant growth, increasing +153% in the key demo (496k vs. 196k) and +66% in total viewers (1.165m vs. 702k). During the heightened news cycle, FNC actually lost viewers at 10 pm, decreasing -13% in the demo (480k vs. 552k) and losing -16% in total viewers (1.802m vs. 2.154m) vs. a year ago. Check our sister blog, All Things CNN, for the full release and more ratings news.